Over the course of the last few years of designing web sites, I have always been on the look out for a particular design that was modern, simple, elegant with a certain degree of style and sophistication. To be able to create a workable, abstract style interface was a long standing goal. I had always wanted to experiment with design, and looking to the art world, I finally found what I was looking for. 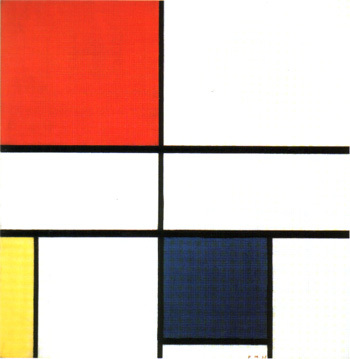 The artist Mondrian, had created a style that was so unique and identifiable, yet in my opinion, pleasing to the eye. The painting I first saw was Composition of Red and Blue, 1935 in the Tate Modern in London UK. I was immediately drawn to the style. It was eye-catching, yet simple. It looked how I imagined my site would look. This was when I developed a certain keenness to find out more about this artist. On my return from London, I first created the web site, Madagasgar.com. It was while creating this site that I thought it would be prudent to include an area covering Mondrian and his work. To my dismay I found that no one web site had an acceptable range of content about the man. So this is my attempt to combine together as much as possible about this great artist of the 20th Century. I hope that you will find this site both informative and useful, and will get as much joy out of it as I have had in creating it. Please be sure to read the credits and visit some of the other sites I have found about Mondrian. Originally written in 2002, edited in August 2010. Composition with Red and Blue (1935).